The recent deaths of turtles and dolphins along the Gulf coast puzzle scientists, raising questions about the oil spill. (CNN) -- One year after the chocolaty crude started spewing out of the bottom of the Gulf of Mexico, leading to the largest accidental oil spill in history, scientists say they're still trying to piece together what's happening to the environment. But the big picture hasn't come into focus yet. Did the oil spill shatter the Gulf's food chain? Will fish have trouble reproducing because of exposure to hydrocarbons? What did those dispersants, which were supposed to break up the oil, do to the ecosystem on the bottom of the Gulf of Mexico? Or did the Earth already heal itself? Scientists can't say for sure, and it may be years or decades before some of these nagging questions about the Gulf oil disaster's impact will be answered with any sort of authority or clarity, they said in interviews. The lab geeks know this is frustrating both for journalists and the public, but they beg for our patience as they try to put this enormous puzzle together. "Scientists have two things that probably aggravate the lay public. One of them is 'I wish I had more data' and the other is 'I wish I had more funding,'" said Christopher Reddy, a senior scientist at the Woods Hole Oceanographic Institution, who has been studying the impact of the spill. "But, in this case, prudence trumps urgency -- or, in your case, the curiosity of your readers." He added: "We have thousands of samples still in the queue to be analyzed or haven't come out. It may take many years to determine whether some (particular) species was affected. You just have to be prudent at this point. The one year anniversary is a day for mourning and reflection; it's not a day for science." In this relative data vacuum, politicians, pundits and science-types have spun stories about the impact of the oil spill on the natural environment. There's the bacteria-ate-the-oil-so-everything's-fine storyline, as offered by the National Oceanic and Atmospheric Administration. That federal agency in November issued a much-disputed report saying the vast majority of the oil in the Gulf had evaporated, dispersed or was eaten by microorganisms. At the other end of the spectrum, it's the eco-pocalypse angle, as supported by scientists who, especially in the early days of the spill, said oil could coat Louisiana marshes and kill off most everything in the path. "There may be tidbits of truth amongst all these topics," Reddy said. "The unfortunate thing is that we can't put the Gulf in an MRI. So despite heroic efforts to collect samples, we can't look to see if there has been an area that's been damaged directly." While the oil's effect on specific species remains unclear, scientists can say with some certainty that the Gulf oil disaster was not the all-out catastrophe it seemed it would be in the early days of the spill, said Roger Helm, a marine ecologist and chief of the environmental contaminants division at the U.S. Fish and Wildlife Service. Beyond that, he said, much is uncertain. "This isn't something where people should say, 'Oh well, we dodged a bullet.' I think that's an incorrect conclusion," he said. "It's unlikely at this time that we will have a catastrophic effect. The probability is low. But there's no question that a lot of oil was released, a lot of animals died and this system, at least over the short term, is not going to be the same." Helm is on a team of federal scientists working to conduct a formal Natural Resource Damage Assessment, which is a mandated accounting of what impact the disaster had on the Gulf environment. The assessment will be used to charge responsible companies, including BP, for the damages. If the government and responsible companies don't agree on the scope the damages and the cost of repair, the process can end up in litigation. Much of the information that will be used for that assessment will be available in three to five years, Helm said. Speculating about the situation before that would be irresponsible and beyond the bounds of what science allows, he said. The fact that scientists are saying "we don't know " is not the same as saying everything is fine, said Samantha Joye, a University of Georgia oceanographer who has been studying the impact of the spill on the deep waters of the Gulf. "With the dead dolphins and the dead sea turtles and the dead baby sharks -- I think the impacts on the system are much more serious than anyone's willing to admit or talk about," she said, "and I find that really disturbing. "The people who live there, they see this every day. They know what's going on. And (elsewhere) it's just dropped off everyone's radar." In December, Joye traveled to the bottom of the Gulf of Mexico in a submarine. She found an oily substance coating the seafloor, she said. It appeared to have fallen on the bottom of the ocean from above. "This stuff came down like a blizzard, and the fact that it came down so fast means that sessile (immobile) organisms had no escape. They basically were buried by it or suffocated by it," she said. She found dead worms, crabs, brittle stars, sea urchins, corals and sea fans, she said. All of that is bad in and of itself, she said, but it also raises big questions about what the damage on the ocean floor means for the rest of the Gulf ecosystem. Changes a mile beneath the surface can take decades or longer to work themselves out of the environment, she said. There are several reasons scientists are hesitant to make big claims about the health of the Gulf after the oil disaster. One is that history teaches us to expect the unexpected. Three years after the Exxon Valdez oil spill in Alaska, the population of herring collapsed. No one saw that coming, and that fish species, 22 years later, is still reported to be struggling. It's a "cliche of ecology" that everything's connected, but it's true, said Andrew Whitehead, an assistant professor of biology at Louisiana State University. The Gulf ecosystem is a maddening web of causes and effects, and it's impossible to know what long-term impacts the spill will have, he said. Whitehead has been studying gulf killifish to see if those fish that were exposed to petrochemicals will function differently long after those chemicals are gone. Specifically, he wants to know if the oil has made fish DNA function in a different and possibly harmful way. "Initial mortalities that make the news aren't necessarily the most predictive of the long-term effects (of oil) on populations," he said. "It's those sub-lethal effects on growth, on reproduction that are the most insidious for really impacting populations in the long term." Another reason for uncertainty is that the Gulf spill was unprecedented. More than 200 million gallons of oil were released into the water, making it the largest accidental oil spill in history; furthermore, the spill occurred 5,000 feet below the surface of the ocean, making the situation hard to monitor and study. Some deep-water scientists have taken to calling the ocean floor "inner space" because we know less about it than some parts of outer space and the moon. The federal government also authorized the use of chemical dispersants to break up the oil at these extreme depths. The impact of that decision is unknown and will play out over years, said Elizabeth Kujawinski, an associate scientist at the Woods Hole Oceanographic Institution who has been studying the impact of dispersants on the environment. "I don't think we have a good handle on ecological impact yet," she said. Migrating animals are also cause for confusion. In some cases, it's just impossible to check up on a particular kind of fish or bird because those creatures only come to the Gulf once a year or once every few years and then move away -- possibly after being affected by the oil. 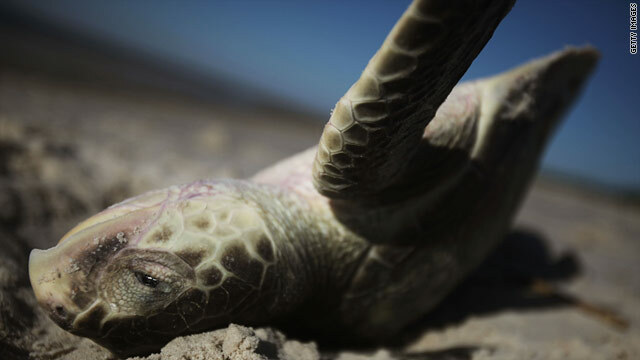 "The turtles that were impacted in this event won't really come back to nest for somewhere between 20 and 30 years" even under normal conditions, said Helms, from the U.S. Fish and Wildlife Service. "There were a lot of whale sharks that were in the area; we're not really sure what happened with the whale sharks and their movement" after the spill. Finally, these effects also are difficult to pin on oil. Since January, 199 dead sea turtles and at least 86 dead baby dolphins have washed up on Gulf shores. It's unclear to what degree these deaths were connected to the spill, according to NOAA reports, but the dolphin deaths in particular have been determined abnormal enough to be called an "unusual mortality event" by the government. Scientists say they're working furiously to figure things out. "There's some great science going on -- it's just not ready at the one-year anniversary," said Reddy, from the Woods Hole Oceanographic Institution. "Because the one-year anniversary is just an arbitrary day."